The Accidental Locavore’s friend Carol commented recently that not everyone knows what chacuterie is. Charcuterie is the art or business of preserving meat. Whether you realize it or not, you’ve been eating it since you were a kid. If you’ve ever had a bologna sandwich, a hot dog, or bacon, you’ve had charcuterie. It evolved from farmers who, when they butchered an animal, needed to use the whole thing and make it last. Hams, sausages, salamis and smoked meats are all examples of charcuterie. This month’s Charcutepalooza challenge was “stuffing”. The Accidental Locavore stuffed her merguez last month, so with that experience under her belt, it was on to more sausage. When we were in Nice, my husband had a delicious, local, small pork sausage, saucisse Perrugina, and that was what I wanted to make. You would think in this Internet age, finding a recipe for them would be easy. Not true. Google search, not much luck. Every charcuterie cookbook, nope. Every French (and Mediterranean) cookbook, same result. A couple of Twitter requests, nope. Even my heroes at D’Artagnan came up empty-handed (wrong area of France). While I had the multiple charcuterie books out, I asked my husband (he does have to eat this stuff too), what he wanted. “Hot Italian sausages”. Hot Italian sausages it was. 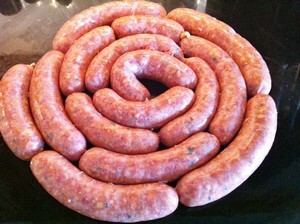 After using the tiny sheep’s casings for my merguez, stuffing into the larger hog casings was so much easier! So how were the hot Italians? Delicious, but according to my husband, not hot enough. The Accidental Locavore liked them because they packed a little heat, but didn’t overwhelm the rest of the dish. 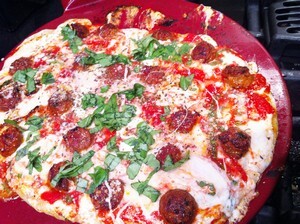 The grind was good and the addition of basil and oregano from my garden (finally) kept it local and fresh. We put them on a four cheese pizza (more about that later) and they gave it just the kick it needed. And the saucisse Perrugina? Still would love to find a recipe for them. Anyone out there have one? I love Italian sausage. My family has been buying the BEST Italian sausage in the world from the same family in Denver for four generations. Can’t find anything even close in NYC 🙁 But I still would have liked to eat your pizza!